Kalido Koala is cousin to PK Sparkles. Kalido also performs. His coat is covered in the same quirky performing arts motifs dedicated to the large local community involved in theatre, music, dance and singing, woven into a patchwork of colour. 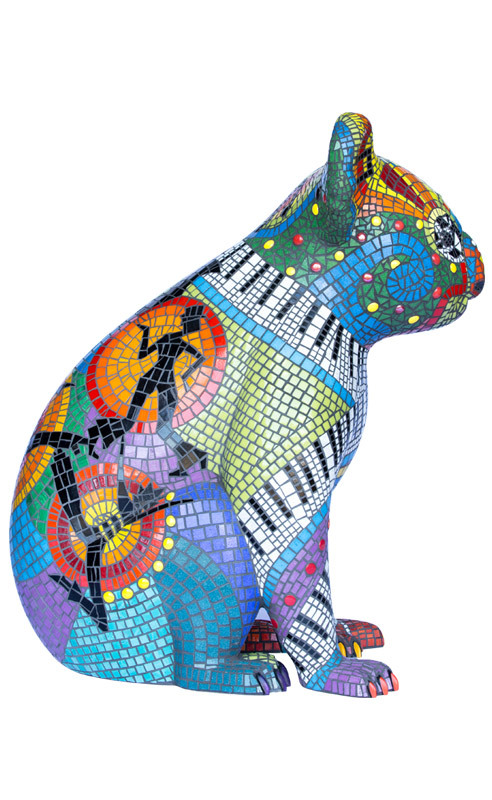 Francessca has worked locally for over 25 years in the performing arts arena and is also "addicted to mosaic". 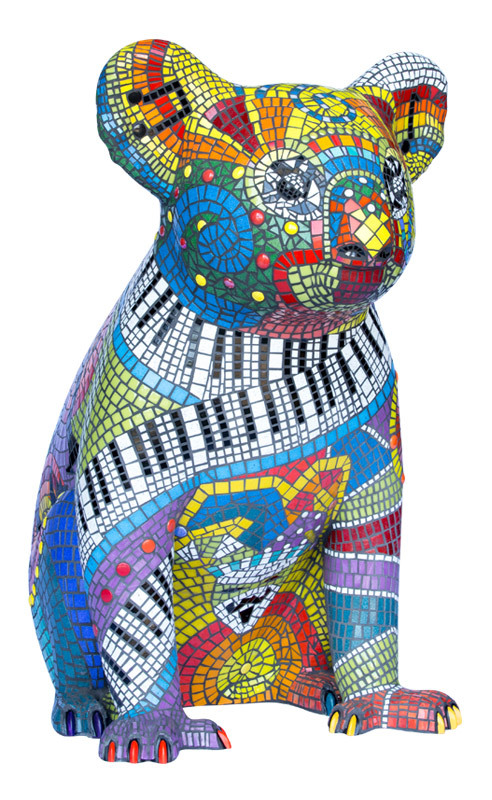 It was therefore no surprise that the two mosaic sculptures created by Francessca for the Hello Koalas Sculpture Trail - Kalido and PK Sparkles the Performing Koala - were inspired by her desire to recognize the talent of so many young people that have left the region and pursued outstanding careers in the performing arts, both nationally & internationally. 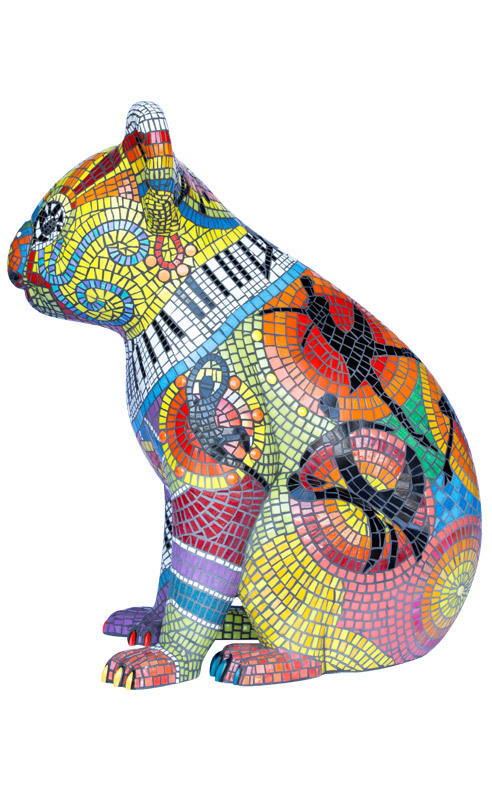 Francessca's vision was to create a pair of fun, colourful mosaic koalas that would inspire delight and wonder. 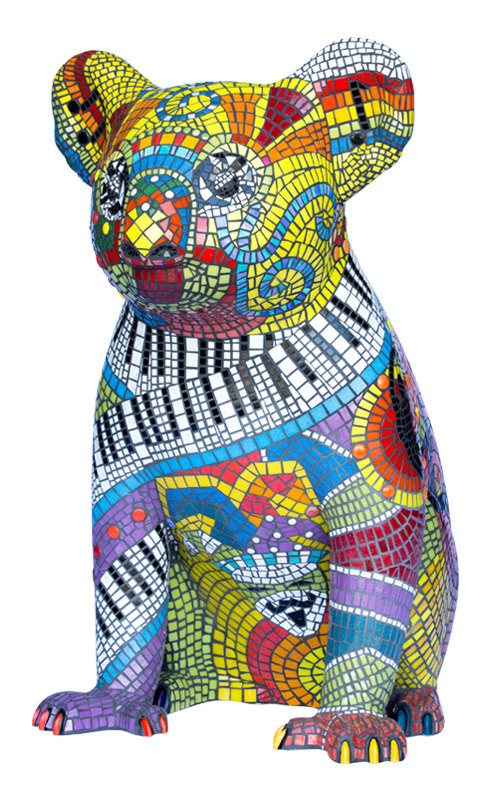 The two designs include quirky performing arts icons of dance, drama and music and a bandaged leg in recognition of the wonderful work done by the Koala hospital. 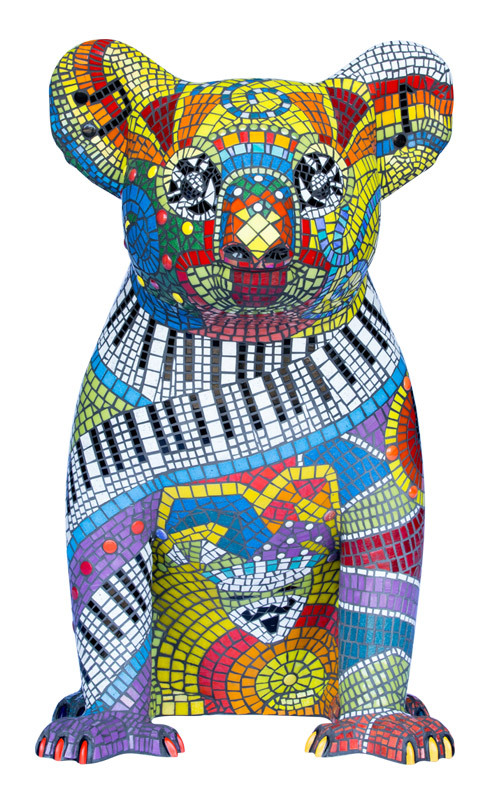 She also wanted to pay respect to country & the indigenous community by the addition of particular colours & concentric circle symbols which appear on the back of the Koala. Happily both designs were selected and so began the first of two Koalas. Transferring the design from her A4 original, to the larger 3D sculpture took Francessca longer than expected as the curves effected the shapes and design. The first sculpture was completed in 6 weeks. 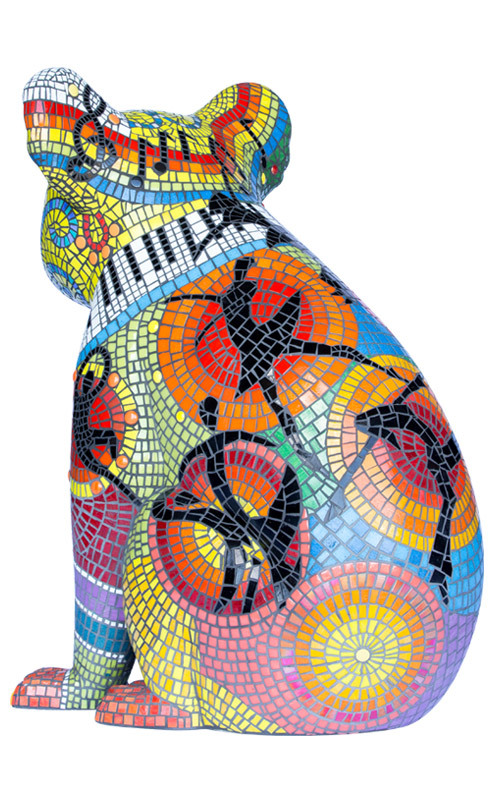 Francessca's work covers mosaics in both 2D & 3D forms, jewellery, painting, etchings and sculpture. She loves to explore and experiment, try new materials, new ideas and play with different materials, colours and textures. According to Francessca, inspiration for designs is largely from nature, exploring shapes and forms that intertwine and flow with colour the driving force. Other themes she has explored are the curves of the human form and ancient symbols and shapes from Chinese, Maori, Mexican and Mayan mythology and the earth and its many layers. Exploring various materials has added texture and a certain tactile quality to many of the pieces that draws people in to want to touch and explore the surfaces. The use of both flat and textured finishes and use of glass and reflective tiles also add a fascinating new dimension with the play of light and shadow. Francessca has also worked with pebbles, sea glass, wood and driftwood. 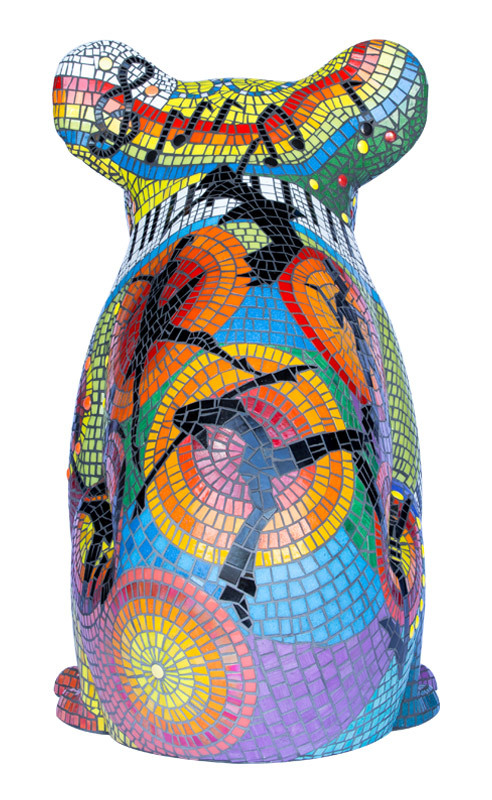 The rich colours of the various tile, pebbles, glass, beads and mirror are intensified by the choice of coloured grout which ties the final piece together. 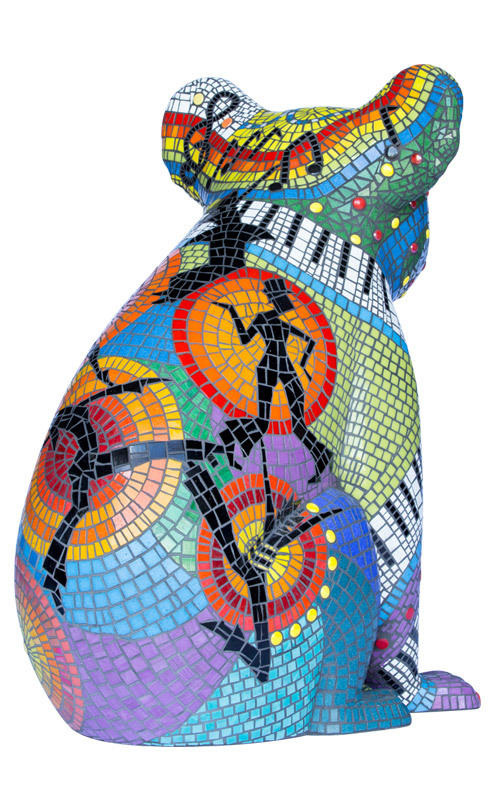 As the founder of 'Out There Design & Mosaic" Francessca creates large murals, designer mirrors and 3D work exploring the human form and driftwood and mosaic sculptures.